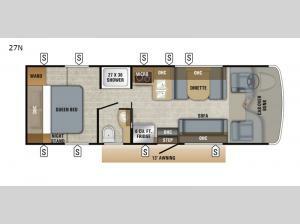 Step inside this Jayco Redhawk SE 27N class C and experience a motorhome that will take you on an adventure of a lifetime! It features a rear private bedroom with plenty of room in the wardrobe for you to store all your clothes and be ready for any occasion, as well as, overhead cabinets, a night stand, and a walk- around queen bed to get a good night's rest. You will love the convenience of the walk-through bath too. A great place to enjoy your meals at is the booth dinette, which can also be transformed into an extra sleeping space. You can enjoy your delicious leftovers once again when you store them inside the spacious 6 cu. ft. refrigerator!